Two years ago while visiting Shanghai, my wife and I saw an incredible media presentation about the upcoming World Expo that was being held in 2010. Since I am a big fan of Expos and World Fairs, having attended 5 previous ones and the sites of 4 others after they closed, we made the decision that we would return to Shanghai to see the Expo. What we did not realize is that in China this has become an event that rivals the Beijing Olympics. In fact, the Chinese claim to have spent more in preparation for the Shanghai Expo than the Olympics in 2008, and it is evident. Advertisements and images of the Expo’s Gumby-like mascot, Haibao, can be found throughout China and on every city block of the host city. Shanghai has been transformed into a pristine world-class city worthy of hosting this major international gathering. The sheer enormity of the Shanghai Expo has made it a remarkable event (192 countries and over 50 international organizations have pavilions and displays). This far exceeds any previous World’s Fair or Expo. Also, attendance is projected to go over 70-100 million visitors for only a six-month period (so far the highest recorded day was July 17 with 557,200 visitors). In addition to being the most costly Expo ever, it is also by far the largest in size and scope. World Expos have captured our imaginations in the past because they have provided countries and businesses with the opportunity to advertise themselves and project the image they want other people from around the world to see. Many Expos became noteworthy because they featured innovation and unique architecture. The Shanghai Expo continues this great tradition by also excelling in all these areas. Its unique pavilions, structures, and displays are stunning in their innovation and stretch the limits of visual creativity. My family and I had the opportunity to attend the Expo over four days in the beginning of August. 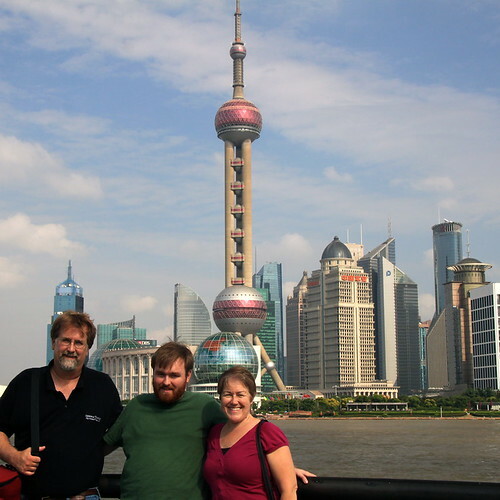 We had originally projected that five days would be enough to see everything, but a canceled flight from Newark to Shanghai reduced our visit. Our estimates were totally inadequate. To seriously see the Expo and to take in all the major exhibits, it would probably take a person about 2 weeks. Four days barely seemed to put a dent into fully enjoying everything the event had to offer. The Shanghai Expo is located in the Nanpu and Lupu Bridge region in the center of Shanghai just south of the famous Bund region. The exposition is divided into 5 major zones that contain pavilions from countries, cities, businesses, and international organizations. There are also sculpture gardens, shops, performance stages, a sports arena, and a major performing arts centre. 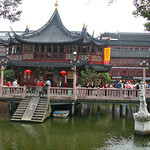 The most popular pavilion is hosted by China. The waiting time to get in usually ranges from 5 to 10 hours. Other popular pavilions are hosted by Saudi Arabia, The United Arab Emirates, the United Kingdom, Italy, France, Japan, Korea, and Germany. Waiting times for any of these pavilions is anywhere from 3 to 7 hours. Fortunately, for us the lines to get in at most of the pavilions were an hour or less. We were fortunate to visit many of the popular pavilions and found that indeed Saudi Arabia and the Emirates had excellent exhibits, but we also enjoyed other countries such as Thailand, Morocco, and Mexico. Our experiences at the pavilions became the highlight of our visit to the Expo. Part of the magic we experienced at the Expo came from stories and impressions we gained from each exhibit as well as the reaction of the Chinese visitors. Each pavilion seemed to take on its own unique character and often revealed interesting insights into people and culture. I was excited to visit the French pavilion, because I had read that it featured six paintings and one sculpture on loan from the Musée d’Orsay. When I arrived at the area where the artwork was featured, I found much to my amazement that there were very few people there. I was puzzled, because in my mind this was the highlight of the pavilion, and I thought it would be packed with visitors. I gained a quick lesson on cultural differences when I soon noticed that the Louis Vuitton area was the most crowded. Apparently the Chinese visitors were much more interested in current fashions than historic art pieces. Exhibits at other pavilions were often puzzling to understand. The Spanish pavilion is one of the architectural highlights of the Expo because it is a large irregular shaped structure covered in wicker that is crafted to reveal Chinese characters. We were excited to see this exhibit and waited about 90 minutes to get in. The first room was alive with images, music and the sounds of Flamenco. In the middle of all this were actual dancers who performed throughout the day. The next section continued to build excitement by featuring larger than life moving images of Spanish cities along with beautiful scenic vistas. After this we were anticipating an incredible finale, but found that the third room was a cavernous hall that contained an enormous life-like moving statue of baby. Even more bizarre were the bubbles floating down from the ceiling. Almost everyone stood there looking at the statue with puzzled expressions on their faces. After a few minutes we began to laugh, because we didn’t know what to think. I’m sure this was significant in some artist’s mind, or maybe the Spanish were simply having fun with us. We are still not sure what they were trying to say, but it sure was memorable. Clearly through the preparation and enormity of the event the Chinese were looking to make a strong statement about the strength of their country and people. Nowhere was this more evident than the dominance and massiveness of the crown-like Chinese pavilion. It towers above the other pavilions and is the center focal point of the Expo. It is impressive in every way from the ascending process each visitor has to take to enter the pavilion to the innovativeness of the exhibits. Ironically after spending over two hours viewing every exhibit in the building, I seem to have forgotten most of it. But one image does firmly stick in my mind. At one point we boarded a Disney-like train ride that took us into a fantasy like world of achievements in China’s urban development from ancient to modern times. In the front of each car was a young Chinese woman dressed in a uniform who waved robotically to greet visitors. As soon as the car was out of sight of the ride operators the first thing the young woman did was uncharacteristically drop her perfect behavior, take out her cell phone, and check her text messages. Quickly I was reminded in this small way that regardless of the cultural differences, human behavior around the world is remarkably the same. This was the normal reaction by any teenager anywhere in the world to being bored. I must admit that I had some trepidation on how my home country would present itself. After reading many negative comments online, I was prepared for the worst. But quite the contrary, I thought the experience at the United States pavilion was one of the best. Clearly the organizers had given great thought to handling large numbers of visitors each day, and they prepared a pavilion that would smoothly move people from one exhibit to the next while entertaining them at each stage. The presentation began with an amusing video showing every day Americans trying to pronounce Chinese words. This set a great tone, because it showed us as Americans laughing at ourselves at not being able to accomplish the simple task of saying a few Chinese words. The Chinese visitors laughed warmly and really seemed to appreciate the humor. The second section contained a three-screen movie featuring various well-known Americans as well as our President and Secretary of State talking about innovation and sustainable development. The third area was an entertaining multi-media presentation about a young girl trying to build a community garden in her city. All three sections were entertaining and warmly received by the visitors. The staff at the United States Pavilion also seemed to go out of their way to make everyone feel welcomed and valued. I felt fortunate to spend four days at the Expo with my family. It is an amazing event that I would recommend to everyone. If you enjoy learning about other countries and want to experience a truly international event, then consider this a unique opportunity to experience the culture of almost every nation in the world in one relatively small area. If you are a fan of Expos or World’s Fairs you have to go, but make arrangements soon. The Expo officially ends way to soon on October 30, 2010. Hey Barry, sadly I visited Shanghai in May 2010 right before the World Expo, but I managed to catch a glimpse of the many pavilions there. Hopefully for the next expo, I will make it. Thanks for sharing. Barry, excellent article. Thanks for sharing your experience with everyone. I bet Liping and Liz had a great time too. I’m sorry that you didn’t have the chance to go into the pavilions, but I’m glad that you did get to see the architecture and design. In many ways, this was one of the most exciting aspects of the Expo. I had a similar situation occur just a few months ago. I was at Universal Studios in Orlando, Florida, a few days before the World of Harry Potter opened. I could see everything, but nothing was open to regular park attendees, only VIPs. Your next opportunity to visit an Expo will be in 2012 in Yeosu, South Korea. After that an Expo will be held in Milan, Italy in 2015. I doubt they will be as large as the Shanghia Expo, but I am sure they will be a lot of fun.